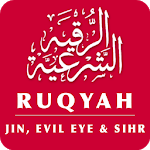 High Quality Ayat Ruqyah Shariah Full MP3 by Sheikh Sudais for Sihr, Black Magic, Jinn & Evil Eye. 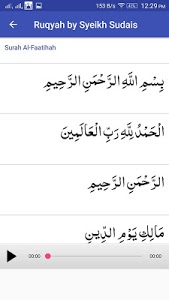 It must be with the speech of Allah (Qur’aan) and his names and attributes. It must be in the Arabic language, or what is known to be its meaning in other languages. To believe that Ruqyah has no benefit by itself, but the benefits are from Allah. Ar Ruqyah Ash Shirkiyah: this contradicts the conditions of Ruqyah Ash Shar’eeyah and has in it Shirk, associating partners with Allah. It leads a person to his destruction in this life and the next and increases calamities and sicknesses. 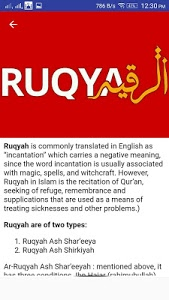 This type of Ruqyah is prohibited, from the statement of the Prophet (saws) This type includes: Magic (whether learning, practicing, or teaching it), Fortune telling, Horoscopes, superstitious belief, and at-Tameemah ( charms and amulets). He must keep far away from all unlawful places and situations that canlead to what is forbidden, for example isolating himself with a female, etc. He must guard the affairs of his patients and protect their secrets. he must propagate the religion of Allah. Give the Patient advice and admontitions on the rights of Allah with regards to His commandments and prohibitions. He must have complete belief that harm and benefit are only from Allah. It must be in Arabic, or what is known to be its meaning in other languages. To believe that verily Ruqyah has no benefit by itself, but the cure is from Allah. Not to perform Ruqyah in a state of major impurity (junub) or in a place that is not permissible to perform ibadah i.e. graveyard, bathroom, etc. - New Arabic font for easy reading. - New design for easy to use. 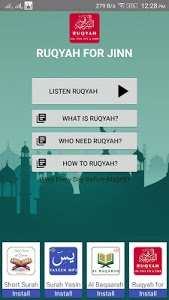 - added info about what is ruqyah, who need to ruqyah, and how to ruqyah. Similar to "Ruqyah for Jinn & Evil Eye"